Mucopolysaccharidoses (MPSs) are a group of rare genetic disorders within the larger family of lysosomal diseases. MPSs disorders are caused by a defi ciency in the activity of a specific lysosomal enzyme required for the degradation of glycosaminoglycans (GAGs). MPS type II, also called Hunter syndrome consists in a deficiency of an enzyme, iduronate-2-sulphatase. We present a rare case of Hunter syndrome with atypical presentation. 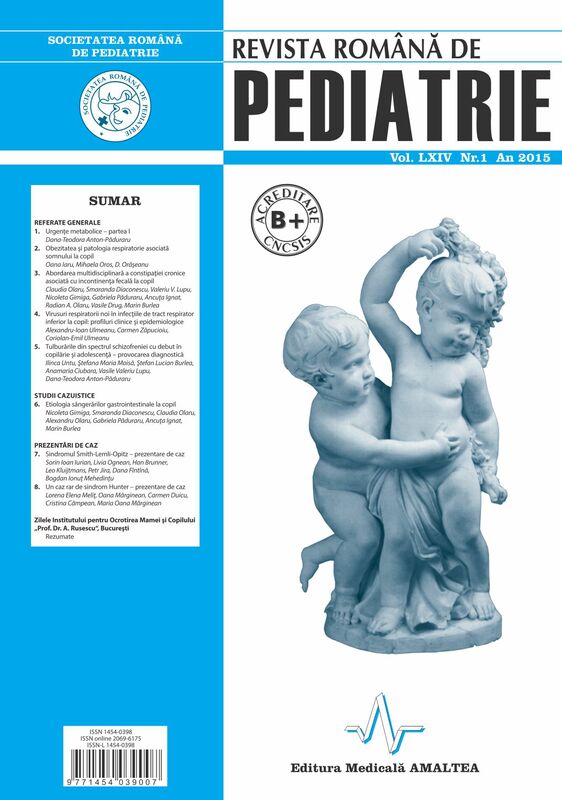 It is a case about a boy of 2.7 year old who presented to the Paediatric Clinic with symptoms of a respiratory tract infection and a history of frequent ear infections and respiratory tract infections. His clinical examination showed the following abnormalities: high stature, moderately overweight, facial dismorphism (coarse facial features, prominent forehead, a depressed nasal bridge), small stubby fingers with flexion of distal interphalangeal joints, joint stiffness, protruding abdomen with umbilical hernia, hepatomegaly and splenomegaly, and also mild mental retardation. The clinical aspect was suggestive for MPS type I, II or VII. Dosage of enzymes with role in mucopolysaccharide lysosomal metabolism revealed low levels of iduronate-2-sulphatase, changes that bent for MPS type II. Enzymatic diagnosis was confirmed by molecular DNA analysis that showed a hemizygote mutation of iduronate- 2-sulphatase gene in intron 3 (c.419-2A > G). Enzyme replacement therapy with recombinant human iduronate- 2-sulfatase (Elaprase®) was started. The evolution of the case after almost two years of treatment with Elaprase is favorably, without loss of neurological acquisitions.